Please select an option Chocolate Ivory White Gray Navy Sage Please select a color. Please select an option King Queen Twin Please select a size. 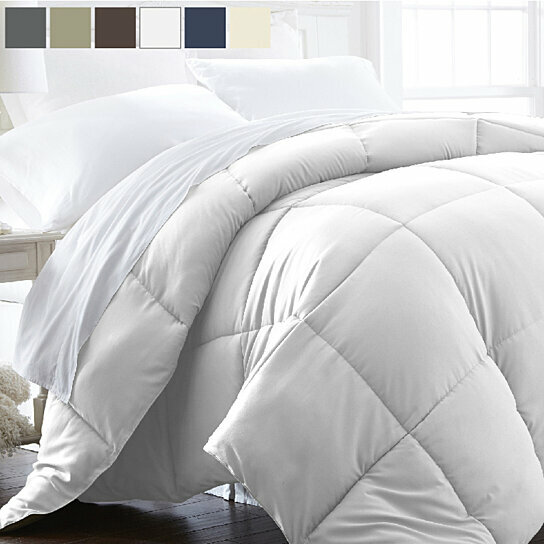 The perfect comforter to keep you cozy every month of the year. The All-Season Down-Alternative comforter from the Home Collection features the perfect loft and down-like feel to keep you comfortable while you sleep. Designed for healthy living and 100% hypoallergenic for allergy sufferers, this luxury comforter presents a quality alternative to down with incredible loft and end to end baffle-box construction, preventing fiber from shifting, eliminating the need for regular fluffing. Twin/Twin Extra Long Comforter: 70" x 90"
Full/Queen Comforter: 92" x 92"
King/California King Comforter: 108" x 94"